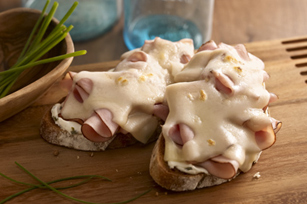 Enjoy the deliciousness of our 'Croque Monsieur' Recipe without having to go to Paris. This 'Croque Monsieur' Recipe can be on the table in five minutes. Broil bread, 6 inches from heat, 30 sec. or until toasted; turn. Spread with cream cheese spread; top with ham and Swiss cheese. Broil 30 sec. or until Swiss cheese is melted. Prepare using OSCAR MAYER Deli Fresh Beef Salami and substituting Manchego cheese for the Swiss cheese. Prepare using Italian bread slices.